Tyrosine kinase inhibitors (TKIs) have been approved for cancer treatment and numerous are under investigation. These drugs are rationally designed to target specific tyrosine kinases that are mutated and/or over-expressed in cancer tissues.Ninety-five percent of all chronic myelogenous leukemia (CML) was suggested to be the result of the altered tyrosine kinase that, under physiological conditions, is under tight control but in fusion is deregulated and expressed constitutively resulting in indefinite proliferation. Imatinib specifically inhibits Bcr-Abl cell proliferation. It competes with ATP for the ATP binding site of the tyrosine kinases. In in-vitro tests imatinib inhibits Bcr-Abl, c-Abl and platelet-derived growth factor receptor (PDGFR) tyrosine kinase. Imatinib is administered orally and is formulated in hard capsules or tablets as a salt (Imatinib methane sulfonate or mesylate). 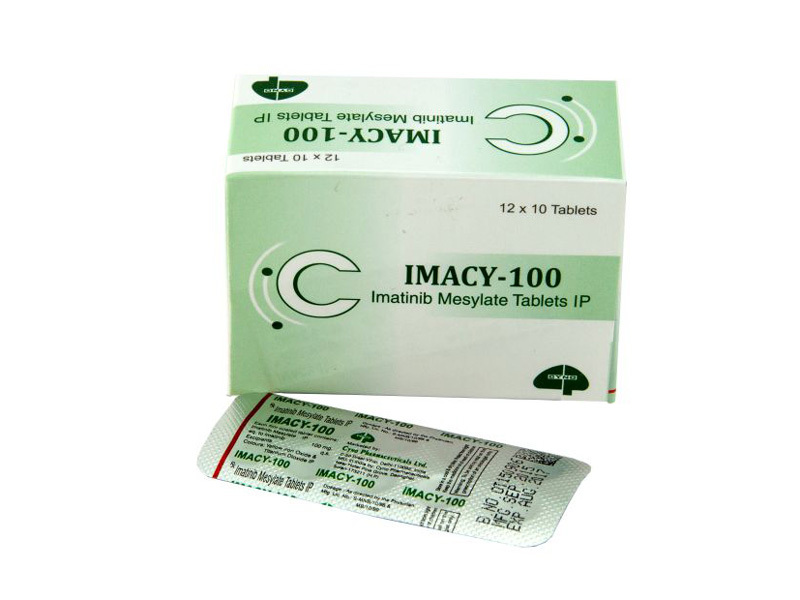 Each tablet contains 100 or 400 mg of Imatinib free base. The recommended dosage for adult patients with Philadelphia chromosome-positive CML at its various phases (chronic, accelerated, blast crisis) or Kit-positive unresectable and /or metastatic GIST is 400mg or 600mg given once daily with a meal, as a monotherapy. In children with CML, daily doses range from 260mg/m2 to 340mg/m2. The treatment is continued until disease progression or unacceptable toxicity. Imatinib is rapidly absorbed after oral administration with a peak plasma concentration at 2 hrs. The bioavailability of Imatinib is ∼ 98% which is irrespective of oral formulation (solution, capsule or tablet) or dosage (100mg or 400mg). Imatinib is extensively distributed into tissues and highly protein bound, predominantly to albumin and α1-glycoprotein (AGP), which is translated into a large volume of distribution of 435 L and a long half life of 18 hrs. Imatinib only penetrates in the cerebrospinal fluid (CSF) to a limited extent. Imatinib is primarily metabolized through CYP3A4 and CYP3A5 with CYP2D6, CYP2C9, CYP2C19 and CYP1A2 playing a minor role. Patients carrying a polymorphism in CYP2D6 (*4 allele) show a reduced apparent clearance indicating that CYP2D6 appears to be important in-vivo in the metabolism of Imatinib. The main metabolite is CGP74588 which represents approximately 10% of the Imatinib AUC and has similar potency in vitro. Imatinib is mainly eliminated through the liver. The kidneys only excrete a minimal amount of the drug and its metabolites. Of a single dose Imatinib in healthy volunteers 81% of the dose was recovered in urine and feces in 7 days. certain macrolides, CYP3A4 substrates with a narrow therapeutic window, or warfarin and other coumarin derivatives. Both Imatinib and its active metabolite can be distributed into human milk. Patients concerned about their fertility on Imatinib treatment should consult with their physician. Doses of 400 mg or 600 mg should be administered once daily, whereas a dose of 800 mg should be administered as 400 mg twice a day. Patients should be advised to tell their doctor if they experience side effects during Imatinib therapy including fever, shortness of breath, blood in their stools, jaundice, sudden weight gain, symptoms of cardiac failure, or if they have a history of cardiac disease or risk factors for cardiac failure. Do not store above 30 0C. Overdose can cause severe muscle cramps. Use of Imatinib mesylate is contraindicated in patients with hypersensitivity to Imatinib or to any other component of Imatinib mesylate. Women of childbearing potential should be advised to avoid becoming pregnant.